BAYTOWN, Texas – The search continues for the killer of a 30-year veteran of law enforcement who was shot in Baytown early Monday. Harris County Pct. 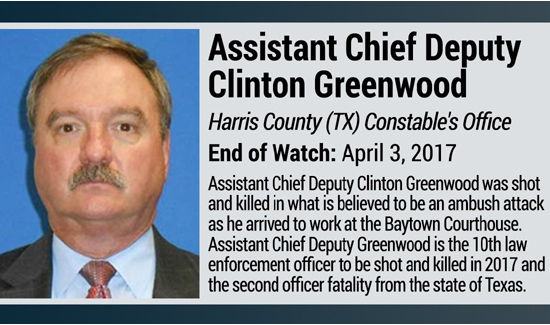 3 Assistant Chief Deputy Constable Clinton Greenwood was airlifted to the hospital but did not survive, Lt. Steve Dorris with Baytown PD confirmed at a morning press conference. Monday afternoon, Governor Greg Abbott announced that an additional $15,000 was being offered for information leading to the identification of a suspect. The addition brought the total reward amount to $65,000. Along with the vehicle in this video, authorities are also looking for a white or Hispanic male, approximately 6 feet to 6 feet 3 inches tall with short hair and medium to stocky built who was seen in the area around the time of the shooting. Police said this person was possibly wearing a dark jacket with a patch on the sleeve. Lt. Dorris said at about 7 a.m. officers received a call for assistance at the county courthouse on W. Baker Road near Garth Road. Officers arrived to find the deputy shot at least once. They came to his aid, and he was transported by ambulance to Life Flight waiting nearby. He was then taken to the Texas Medical Center where he was later pronounced dead. Greenwood spent more than three decades in both law enforcement and in the courtroom. Lt. Dorris said Baytown PD is working the investigation, but so far there are not enough details to discuss a possible suspect, suspect vehicle or motive for the shooting. “This morning the Harris County Pct. 3 Constable’s Office suffered a great loss,” added Constable Sherman Eagleton. Monday night, trucks lined up near the crime scene with flags flying for a fallen deputy constable. “We all pull together to honor a fallen deputy,” said David Garcia, who came together with a group of tow truck drivers and a group called Houston Area Off-Road Recovery. “My hear kind of sank at first,” said Charlie Frazier, a neighbor. She was at home getting ready for school when she told us she heard four gunshots. “They kept coming by questioning different people, they questioned people in the neighborhood the entire day,” said Cyndi Frazier, Charlie’s mother. “Thoughts and prayers go out to his family and to his brothers and sisters on the force first and foremost. It’s a horrible thing,” Frazier said.